The defense needs to contain Hundley. He's had too many scrambling opportunities. As I typed that, Stanford had a very nice sack on him. FG UCLA from 39 yards. Gaffney is just a workhorse. Perfect running back for Stanford's style. That catch and run by Montgomery was comical. Touchdown Stanford. Hogan 30 yards to Kodi Whitfield, who made an acrobatic one-handed catch in the end zone. Ukropina's adds the extra point. 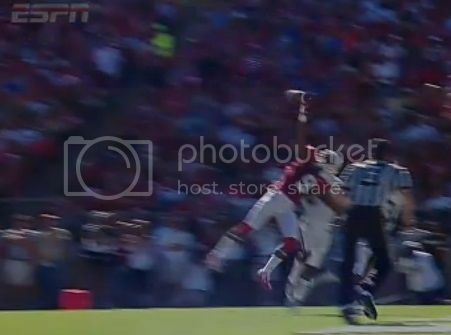 Interception Stanford. Holding penalty during the return wipes out a long return for a touchdown but Stanford will have the ball. The interception extends Stanford's streak of games with at least one takeaway to 32 games which is the best in college football. It looks like Stanford will get a touchdown off the interception anyway. Touchdown Stanford. Gaffney 1 yard run and reached the ball over the goal line. Play was upheld after the review. Ukropina adds the extra point. Stanford can't afford to lose Ben Gardner.